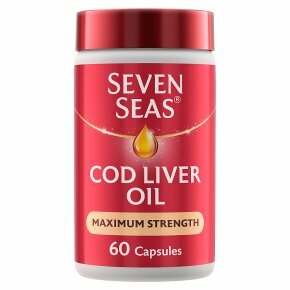 60 One-a-Day Capsules - Food Supplement Gelatin Based Capsules Containing a Blend of Fish Oil and Cod Liver Oil, Fortified with Vitamins D & E.
Dosage: Adults and children over 12 years: One capsule a day with a cold drink. Do not exceed the recommended dosage. Food supplements are intended to supplement the diet and should not be regarded as a substitute for a varied diet and a healthy lifestyle.